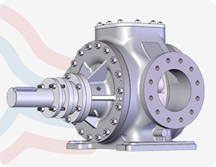 Our C range of Centrifugal Pumps can be supplied as new pumps or as replacements in a variety of differing materials. Albany Pumps manufacture our own supply of long-established designs, first created by Stothert and Pitt. We manufacture Centrifugal Pumps to accommodate the heavy-duty requirements of applications, including foods and other types of cargo. Available in either horizontal or vertical moun ted options with a bearing bracket, these pumps can be easily removed for maintenance without disturbing driver, suction or delivery pipework.